Fraud in the popularly used Acid data? In Brief: The oceans are not acidic, and will not become acidic in the foreseeable future. Many of the fears and alarming scenarios are based on models. Many scary headlines are based on studies of extreme pH values beyond the range of anything realistic. Incredibly, hundreds of studies show that for pH changes that we are likely to encounter in the next 100 years, there is arguably a net benefit to underwater life if the oceans became a little less alkaline. 4. IPCC WGI state that the mean pH of surface waters ranges between 7.9 and 8.3 in the open ocean, so the ocean remains alkaline. It is dishonest to present to a lay audience that any perceived reduction in alkalinity means the oceans are turning to acid. 5. The claim that “ocean acidity” has increased by 30% since before the industrial revolution was calculated from the estimated uptake of anthropogenic carbon between 1750 and 1994, which shows a decrease in alkalinity of 0.1 pH unit, well within the range quoted by IPCC. Prominent scientists have claimed that high mortality rates in Oyster hatcheries operated in the North West Pacific, are due to “acid seawater” resulting from upwelling of the deep ocean. There is no acid seawater. As stated in AR4 WGI, the oceans are alkaline, not acid. Those same scientists stated that bacterial contamination of seawater was not to blame for the high oyster larvae mortality rates. Contrary to their false claims, the problem of early oyster mortality has been found to be directly caused by a faecal organism, Vibrio tubiashii. Research programs are currently underway to investigate the extent and resolution of the problem. This research is being conducted by the Pacific Shellfish Institute and was known at the time of the acid seawater claims. The fact that this was not considered or was even ignored, when the claims of “acid seas damage” were made, is at worst, mischievous and at best, very un-scientific. AcidGate–-Why Acidification appears to be a fraud based on computer created historical data instead of actual data. Feely, and his coauthor Dr. Christopher L. Sabine, PMEL Director, omitted 80 years of data, which incorporate more than 2 million records of ocean pH levels. 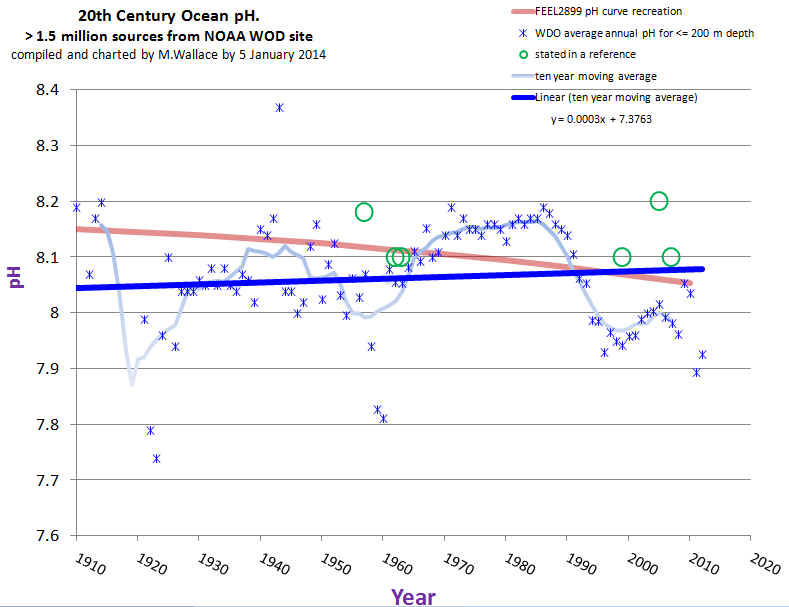 Feely’s chart, first mentioned, begins in 1988—which is surprising as instrumental ocean pH data has been measured for more than 100 years since the invention of the glass electrode pH (GEPH) meter. As a hydrologist, Wallace was aware of GEPH’s history and found it odd that the Feely/Sabine work omitted it. He went to the source. The NOAA paper with the chart beginning in 1850 lists Dave Bard, with Pew Charitable Trust, as the contact. Basics of Ocean Acidification (local) The oceans are buffered by extensive mineral deposits and will never become acidic. Marine life is well-adapted to the fluctuations in pH that occur all the time. This is another example of climate fear-mongering: It never happened before, it’s not happening now, but it surely will happen if we don’t DO SOMETHING!.